The Solar system's innermost planets finally get their own thread! It was announced today that there is substantial evidence for water ice on Mercury. Like Earth's moon, Mercury has a rotation axis that is almost perpendicular to its orbital plane around the sun. This means that the bottoms of craters near the poles never see sunlight, and so remain very cold and dark. This environment is perfect for harboring volatile chemicals like water. The first direct evidence for frozen volatiles in these craters came from radar observations from Earth, but until the MESSENGER spacecraft arrived at Mercury we lacked a map of the features near the poles with which to correlate the radar images. Now that we have these maps, we have determined that the reflective radar images align perfectly with the shadowed polar craters. Other data returned from MESSENGER suggests that the volatiles are primarily water and not other chemicals. However, the data also shows that most of the deposits are buried just beneath the surface and are covered with some very dark material, thought to be rich in organic compounds. Only the coldest craters have exposed ice on the surface. I had heard about this possibility before, but it's still quite a surprise. Also, why doesn't Venus get its own thread? Other than the high temperature, it doesn't really have much in common with Mercury, and there's probably enough known about either to warrant their own threads. Because it didn't seem to me that there was enough on either world to allow for full and well-used threads individually. We've only sent one orbital mission to Mercury, and we have very little data from the surface of Venus, and from orbit it looks rather bland so there's only so many pictures that could be posted, in contrast to Mars/Jupiter/Saturn were we have lots of data and an incredible amount of images. If I'm wrong and they both get a very large amount of discussion here, then they can always be split into separate threads. 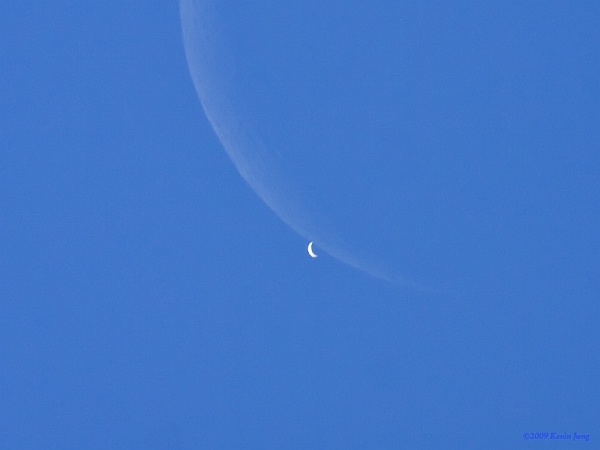 Okay, I found a nice image showing Venus near the Moon (at 2011 occlusion). I has saw this myself with the binoculars and was impressed by the difference in the surface brightness of their two bodies. Venus is about 20 times brighter than the Moon, and this image gets overexposed. Wow, very nice! It is remarkable how much brighter Venus is. Yeah, Venus is insanely bright; I think it's albedo is something like 0.8. Earth's is ~0.35 and the moon is only 0.12. Huge difference those clouds make! Also just curious: I'm sure everyone's seen Venus (it's pretty hard to miss!) but has anyone seen Mercury? Usually it's too close to the sun/horizon, but every now and then you can catch it in the twilight. Also just curious: I'm sure everyone's seen Venus (it's pretty hard to miss!) but has anyone seen Mercury? I've seen Mercury. You just have to know when to look (and have a relatively unobstructed view towards the horizon). It's not hard to see, it's just not in a position to easily be seen too often. Yep, that's right too. Solar flux at Venus is about 2620W/m2, whereas at Earth it's ~1360, or about half as much. I've seen Mercury with the naked eye many times, and a few times with binoculars. But I've never seen it's disk (i.e. with a telescope). I remember seeing the occultation of Jupiter by the Moon in August. It was very cool to see the Galilean moons disappear one by one behind the Moon and reappear again. Venus was also quite nearby, and looking at it in my telescope its brightness compared to Jupiter and the Moon really struck me. I've been trying for almost a year, but haven't seen Mercury yet, since I used to look out onto the east. In april, Mercury was there but never got high enough to see. In August, I was on vacation in Austria and could never see it due to the mountains. I though I would get it during the current period of visibility... But I've moved out and my new apartment looks onto the west. But I should be able to see it when it's visible in the west in February and MArch. I remember seeing the occultation of Jupiter by the Moon in August. It was cloudy here too when it happened. All night long, there were thick clouds and it rained, but I stayed up anyway for a chance to see it, and because the Expedition 32 crew was launching that night. It was about four in the morning, thirty minutes before the occultation, when the clouds opened at the eastern horizon which was getting twilighty with the Sun's approach, and showed the Moon, Jupiter, and Venus. The clouds only got in the way a little after that, it was very cool. I saw mercury once through my 8-inch scope, but it's hard to see it as a disk. Biggest problem is that it's always so close to the horizon, so turbulence tends to be very severe. In fact a crazy thing happened while I was looking through the scope: all of a sudden Mercury shimmered and then vanished without a trace, like a cloaking effect out of a sci-fi movie. It was still at least 5° above the horizon! It startled the heck out of me and I thought I was going crazy or something, but later concluded than an inversion layer must have deflected its light in such a way that it no longer reached me. Just a mirage, in other words. At least that's my best guess; unfortunately I didn't see the sunset and no other sufficiently bright objects were well positioned to test the theory. Though part of me still thinks I caught aliens in the act of stealing the planet (presumably they need metals to build more ships for the upcoming invasion of Earth), then they replaced it with a convincing fake so that Messenger wouldn't find out. And they put ice on it as a joke. "Hahaha, those silly humans, they'll believe anything!" Yeah, well I'm on to you, aliens! You tricky little buggers! I will remain forever vigilant!